There is no stenciling on the plaques, but they have a plate attached which states that the flooring came from the school. Each piece of flooring is unique. The finish may vary, depending on the part of the flooring used. 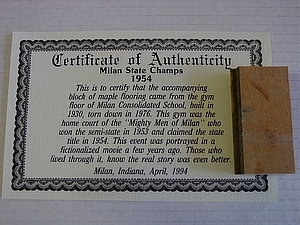 This is to certify that the accompanying block of maple flooring came from the gym floor of Milan Consolidated School, built in 1930, torn down in 1976. This gym was the home court of the “Might Men of Milan” who won the semi-state in 1953 and claimed the state title in 1954. This event was portrayed in a fictionalized movie a few years ago. Those who lived through it, know the real story was even better. 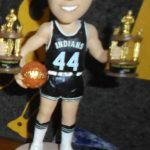 Milan, Indiana, April, 1994.